Sinus Disease Categories - South Bay Allergy and Asthma Group, Inc.
3. nasal mucus drainage that is thick and colored (may be yellow, green or brown) and sometimes bloody. 3. Biphasic illness in which the initial sinus symptoms improve then suddenly worsen with a relapse of fever, headache or increase in thick, discolored nasal mucus discharge/post nasal drip. For any of these cases, an antibiotic prescription is appropriate. In addition, other helpful treatments include saline sinus irrigation or intranasal topical steroids in the form of sprays or aerosols. Decongestants and antihistamines are generally not recommended for acute sinusitis. Chronic sinusitis is inflammation of the sinuses. Acute sinusitis is related to viral or bacterial infection and is usually limited to a period of less than 2 to 4 weeks. However, chronic sinusitis is an inflammatory condition of the sinuses persisting beyond 8 weeks. It may lead to recurrent acute sinusitis in which there are three or more episodes of infection per year. In chronic sinusitis, inflammation involves the mucus membrane lining the sinuses similar to that of asthma. 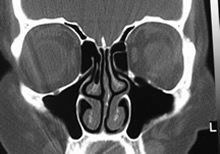 Instead of a hollow cavity filled with air, patients with chronic sinusitis have a thickened or swollen lining seen on CT scan (see white arrows below). Inflammation may be subtle but can lead to infections. Symptoms of chronic sinusitis are often subtle but may include nasal congestion, inability to smell, unrelenting cough, pressure in the forehead, cheeks or between the eyes and constant post-nasal drip. Occasionally, the swollen mucus membrane can block the natural drainage of the sinuses and lead to acute infections. Mucus then turns yellow or green and sinus headache appears. Many patients feel fatigued. Antibiotics may clear the infection but have little effect on the underlying inflammation. Chronic sinusitis may be thought of as “asthma” of the sinuses. 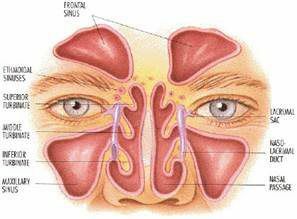 Some patients have nasal polyps which are basically extensions of the inflamed sinus lining into the nasal cavity. This can lead to symptoms of severe congestion, complete loss of the sense of smell and, especially in children, facial distortion or double vision. Chronic sinusitis is difficult to diagnose and may require CT scan. Because the symptoms of chronic sinusitis are often subtle, CT scan may be required to make the diagnosis. Innumerable studies have shown that compared with objective criteria such as CT scans or rhinoscopy, symptoms are little better than random chance in predicting the presence and severity of chronic sinusitis. Although headaches and pressure are routinely present in acute sinusitis, these subjective symptoms are uncommon in chronic sinusitis alone. Surprisingly, a large number of patients referred for chronic sinus headaches actually have migraines and have normal sinus imaging. The CT scan also identifies the anatomy of chronic sinusitis and is also useful for those that go on to sinus surgery. Although chronic sinusitis occurs in the setting of allergic disease, only about half of patients with chronic sinusitis are identified as having allergies. It is important to identify these potential triggers (especially molds) by skin testing or blood testing for allergies. A fewer number of patients with chronic sinusitis have sensitivity to over-the-counter pain relievers such as aspirin or ibuprofen. Unusual causes of chronic sinusitis include immune deficiencies, cystic fibrosis, ciliary dysfunction or immune disorders such as Wegener’s granulomatosis, Churg-Strauss Syndrome and sarcoidosis. Chronic sinusitis is difficult to treat and may require long term medications and or surgery. 3. reduce exercise intolerance or sleep disturbance caused by congestion.